Organizations change. Visionary founders launch organizations. Over the long term, staff work together and make the vision reality, each contributing their own unique passion. 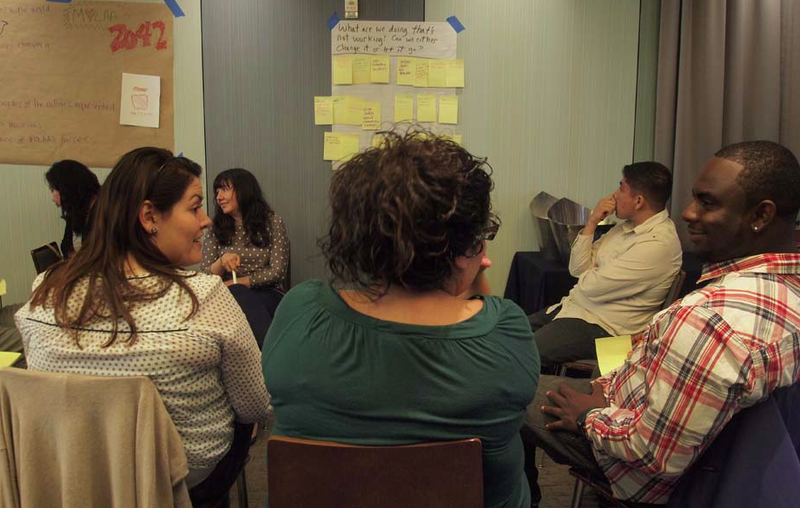 What better place to have these discussions than at a retreat for the Museum of Latin American Art in Long Beach. We opened the retreat by the goals and agenda for the day. 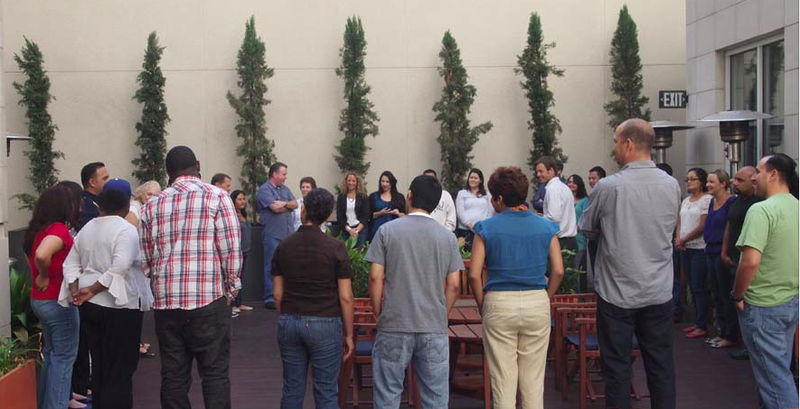 To warm folks up, I led a series introductions in the courtyard outside (I’m a big fan of mixing up time inside with time outside, it helps move the day and gives people a break from being in the same space all day). We shared a beautiful moment where the most senior staff person answered a question from the most recent hire, igniting a conversation around everyone’s passion for the museum’s mission. Part of the retreat revolved around reviewing and updating the organization’s strategic plan, with a focus of the day looking at creating a common vision. After the MOLAA’s President Stuart reviewed their strategic plan, I led a visioning exercise that stared with each person writing their own vision for the museum. Then I asked people to compare notes, first in groups of two, then four and then eight (giving different staff the opportunity to interact with each other). Each group then created a poster that captured the similarities in visions people had at the table, which included four related themes. From this, the group reached consensus on a general direction for moving forward. A key goal for strong teams is working towards a common vision. After a relaxing during an informal lunch outside, we spent the afternoon together working as a team to address common goals. 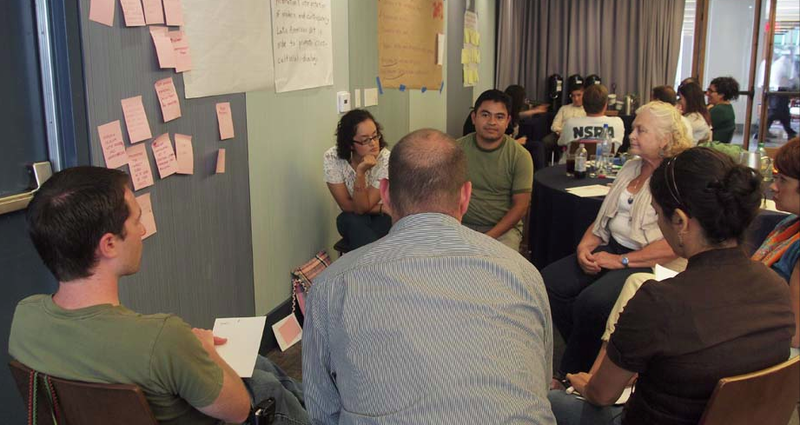 I shared six questions and asked small groups to generate ideas and prioritize their top three suggestions for an action for moving forward (I’m also a big fan of mixing up large group discussions with smaller group conversations, giving more people th opportunity to participate). Representatives from each group shared their top three ideas with the larger group and everyone was given five dots to vote on which ideas they liked best. This helped prioritize the key ideas for moving forward and generated a very good group discussion around several aspects of building effective teams. As I like to do at retreats, I asked the group to form a circle and asked the group to reflect on how they were feeling at the end of the day. Many positive themes emerged. Stuart initiated closing game that generated a lot of smiles and laughter the gave everyone an opportunity to say a few words before the retreat ended. I left the retreat with a great appreciation for the staff that make MOLAA possible. Working together, they make the museum happen! 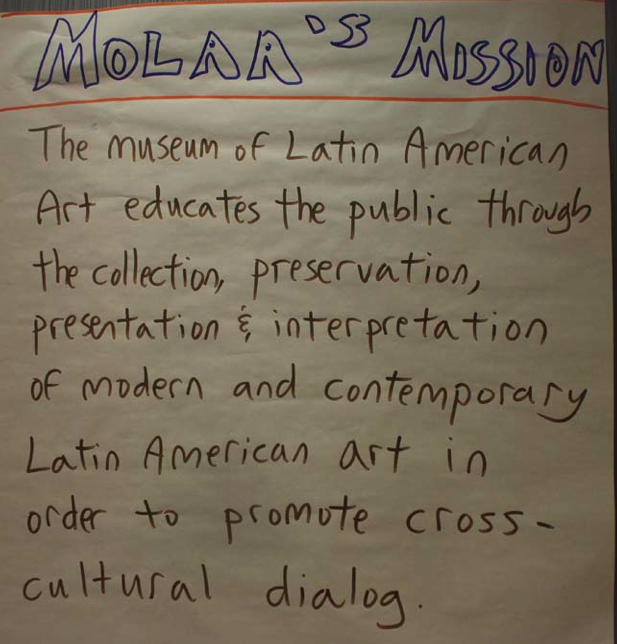 MOLAA is the epicenter for modern and contemporary Latin American Art. Anytime you’re near Long Beach, I encourage you to check it out. This entry was posted in Retreats and tagged #Nonprofit, Facilitation, Leadership, Leadership Development, Retreats, Staff, Strategic Planning, Team Building. Bookmark the permalink.